Some mornings I wake up with a total blank and have no idea as what to pack for Nikolai's school lunch. This time I am thankful for the set of animal pals cookie cutters that I own, a set comes with 50 different cutters and as I was looking at the box, I decided to pick a seahorse. 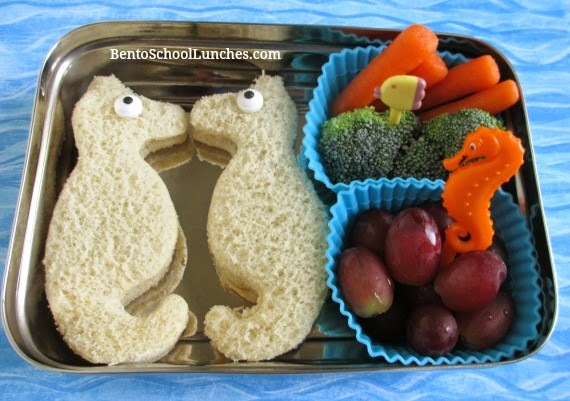 Seahorse shaped sandwiches with candy eyes. Organic red grapes with a seahorse cupcake pick. Organic broccoli florets and organic baby carrots with a fish pick. This lunch is packed in an Ecolunchbox solo rectangle.